The third day of the T.R.A.F.F.I.C. 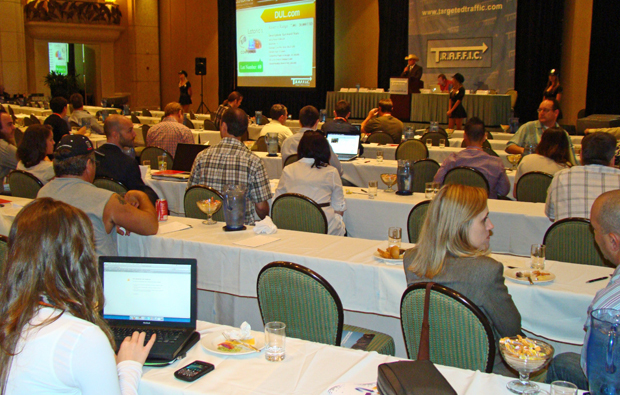 Miami 2010 conference at the Loews Hotel on South Beach Tuesday (Oct. 19) kicked off with the annual T.R.A.F.F.I.C. Awards brunch. Awards were presented in seven categories and two new members were also inducted into the T.R.A.F.F.I.C Hall of Fame - Monte Cahn and Rick Latona. The award winners included the .CO Registry that was voted Sponsor of the Year after a very successful re-launch of their TLD. 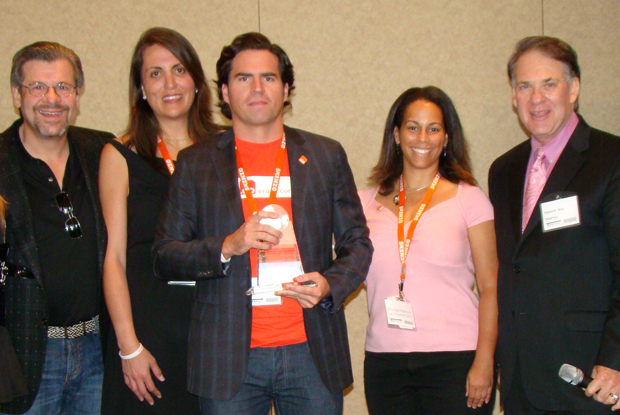 Calle & Crystal Peterson (Senior Manager) with their 2010 Sponsor of the Year Award. I'll have photos of all of the winners accepting their awards in a comprehensive show review article that will be coming out next week. 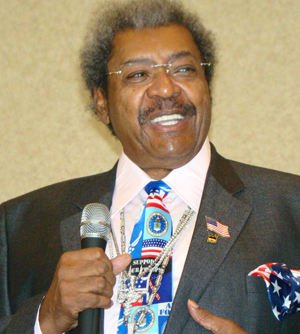 After the awards ceremony, legendary boxing promoter Don King addressed attendees as a special guest speaker. King was a controversial choice as some questioned his relevance to a domain industry audience as well as incidents in his past that led to time in jail. King said those years of incarceration in what he called the University of the Penitentiary prompted him to educate himself (he is a voracious reader) and change his direction in life. The insight he could provide domainers most clearly came during the question and answer session that followed his talk. Rick Schwartz asked King what he would do if he owned domain traffic but received only a miniscule share of the proceeds from selling that traffic via upstream "partners" Google and Yahoo. King said he had run into almost exactly the same situation in his business career. He said that he essentially "made" the HBO and Showtime cable networks with his exceptionally popular boxing cards, however he was paid a pittance compared to the profits he generated for those companies. He said the answer was to find a way around them, perhaps by creating your own distribution channels to sell traffic directly to advertisers. He said he is planning to do something similar with a new People's Network to distribute his shows and promotions. The kickoff could come with a live event (details of which have not yet been released) that he said will be held in Miami December 17th. King said domain owners are currently like "tenant farmers" who produce the crops but get a meager share of the profits from their landlords. "The boss decides what your cut will be," King said. He encouraged domainers to educate themselves so they can create new avenues from which to sell their product. However you may feel about King personally he is an entertaining speaker who can still draw a crowd. After his speech many audience members crowded around him to take pictures and get autographs. Boxing promoter Don King draws a crowd after his talk at T.R.A.F.F.I.C. Miami Tuesday. Three afternoon seminars followed King's talk. Michael Berkens, Owen Frager, Michael Gilmour, Jean-Pierre Khoueri and Rick Schwartz discussed the The Anatomy of a Type-In - what surfers are looking are thinking when they type in an address. Next Monte Cahn, Larry Fischer, Ari Goldberger, Neil Kavanaugh, Kevin Leto, Kathy Nielsen and Rob Sequin offered advice on Prospecting for End Users. The final session covered Domain Security issues and featured Mike Robertson, Jeffrey Eckhaus, Divyank Turakhia, Donny Simonton, Dr. Chris Hartnett, Albert Angel, Michael Berkens and Gregg McNair. I'll have more on those sessions, including photos, in our upcoming show review article. The business day closed with a live domain auction conducted by Rick Latona Auctions that produced close to $500,000 in total sales. The largest sales were Shock.com ($200,000), BVI.com + BVI.co ($110,000), Idle.com ($20,000), MZH.com + MZH.co ($15,000) and Coches.co ($15,000). (Update 10/26/10: Rick Latona announced that the winning bidder for Shock.com and BVI.com did not pay so those names were put back up for sale. Deadbeat bidders are the reason why we never list a domain as having been sold on our weekly or Year-To-Date sales charts until the domain has been both paid for and transferred to the new owner). After the auction, NameMedia hosted a very nice outdoor cocktail reception at the Loews Hotel that ran from 7-10pm. The weather was perfect and the company just as good, making the three hours fly by as if they were minutes. No need to turn in just yet though. As the NameMedia event was closing new Domainer of the Year award winner Gregg McNair was opening up his suite at the Loews for a party (open to all attendees) that was still in full swing when I left to write this post. T.R.A.F.F.I.C. Miami 2010 will conclude Wednesday morning with a T.R.A.F.F.I.C. Advisory Board meeting and an Epik.com SwapFest. Immediately after those events end I will be jumping in the car and making the five-hour drive back to our home base across the Sunshine State in Tampa. I'll have closing day photos and highlights from T.R.A.F.F.I.C. Miami fo you in this column Thursday.